The January 2009 ditching of the US Airways flight in the Hudson River was a rare combination of a spectacular plane crash that generated massive worldwide attention without killing anyone. The plane went down as a result of a midair collision with a flock of geese shortly after takeoff from New York's La Guardia Airport. For aviation safety organizations involved with dealing with the threat of bird strikes, among them Bird Strike Committee USA, the US Airways ditching in New York was an important event because the accident will very likely lead to industry wide changes in regulations and procedures associated with bird and wildlife hazards. This event also served as an excellent example of how popular social media applications like Twitter and YouTube affect how the public finds out about plane crashes. It also shows that any organization that wants to play a significant role in any public debate about bird strike hazards should aggressively use these and other social media tools to help educate and inform the public. While the accident took place on the doorstep of the most important media center in the United States, many of the early images from the crash came not from the media, but from witnesses. One of the most well known photos was from a cell phone camera of Janis Krums, a passenger on one of the ferry boats that helped to rescue passengers and crew. The picture was uploaded from the passenger's iPhone to TwitPic, a service that allows Twitter users to upload photos (see photo on TwitPic). Twitter wasn't the only social media application working overtime that day. Video sharing sites like YouTube were flooded with user-generated content that collectively had hundreds of thousands of views within a day. If social media applications like Twitter didn't exist, a plane crash in New York City would still get massive amounts of attention from the major media. However, the "Miracle on the Hudson" accident also showed how an average eyewitness of a dramatic news event like a plane crash can easily distribute images and other newsworthy information that could reach tens of thousands in a matter of minutes. Until recently, one of the few options for online publishing was through a web site. Ten years ago, AirSafe.com helped launch the Bird Strike Committee USA web site, Birdstrike.org. One of the stated purposes was to have the site act as a resource for the media and the general public, especially if there were an event like as a bird strike-related crash. Even in the days before Google, search engines were the most important way that users could locate information online. Because the birdstrike.org web site had been active for many years, and because it included a wide range of bird strike related information, the site was often among the top results for many bird and wildlife strike related searches. Because of this, major media organizations were able to find basic information about bird strikes and to contact many of the key Bird Strike Committee USA members, and as a result many of these members were able to provide insights and information to a broad audience in the hours after the crash. It used to be that you only needed a solid web site, or perhaps a blog to keep an online audience informed. This approach is no longer good enough. You need more than web sites and blogs to keep in touch with an audience, because that audience is using emerging social media tools to develop different kinds of ongoing relationships with other users, and to find news and other information. For an example of the differences between the Internet of today, and the Internet of a few years ago, one just needs to look at the online realities of two New York area plane crashes, TWA Flight 800 in 1996 and the 2009 Hudson River ditching involving US Airways. Flight 800 happened in July 1996, just two weeks after AirSafe.com was launched. While there were many web sites like AirSafe.com that provided information on the crash, web sites controlled by major media organizations like CNN and the BBC were by far the most important sources of information for news about the crash. In 1996, there was no YouTube, Twitter, Blogger, Facebook, Flickr, or any other easy to use tools for sharing photos, videos, and other information online. While AirSafe.com had plenty of information about Flight 800, the site had only a tiny impact on the public's awareness of the accident, with only about 35 visits on the day of the crash. 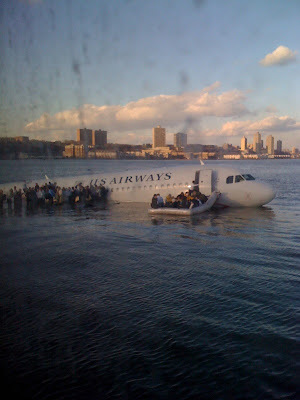 In contrast, within minutes of the US Airways ditching on the Hudson, there were thousands of people around the world who were contacting each other on Twitter, uploading videos to YouTube, and photos to Flickr. True, much of it was simply copied from traditional news organizations, but some of it was both original and unique. In many cases, traditional media relied on the public for information rather than the other way around. By the way, traffic on AirSafe.com was a bit higher in 2009 than it was in 1996, with about 12,000 web site visits on the day of the event, plus at least 5,000 views or downloads of AirSafe.com's initial podcast about the crash. The changing nature of the Internet, and the dramatic rise in the importance of newer social media applications, makes it necessary for organizations like Bird Strike Committee USA to expand its relationship with the Internet. Fortunately for the Committee, there are many examples of social media use that can be followed, and most of them require no up front or ongoing costs. Perhaps the most pressing needs are in the following three areas: first, a review of existing web site policies and content to ensure that the site continues to rank well for key wildlife hazard related search terms. Second, development of policies or guideance for the use of evolving social media applications, to better coordinate public education and public outreach efforts. Third, encouraging the use of these same social media technologies among the organizations that support the work of the Committee. For additional information about Bird Strike Committee USA, and about bird strike-related issues, please visit birds.airsafe.org. Social media and most prominently twitter helps to rout news instantly. It is fascinating how technology and the internet have changed news delivery so significantly. Before the crash of TWA 800, Newsday had never updated their site with breaking news. That’s when they began, prior to that, just copies of their print edition. I may put my own reflections on this in a blog post soon. . . I would like to invite you to visit www.myairportoperations.com a free professional site for airports. Created by Airport Operators for Airport Operators, a website where airport personnel can share ideas, ask questions, or just talk airport.